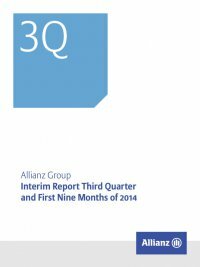 Interim Report Third Quarter and First Nine Months of 2014 Allianz Group40 Assets and liabilities of the Property-Casualty BUSINESS segment Property-Casualty assets Compared to year-end, the Property-Casualty asset base increased by € 5.5 bn to € 106.6 bn. This was primarily driven by higher debt securi- ties, but also by increased equities. It was partly offset by lower loans and advances to banks and customers. Composition of asset base – fair values1 € bn as of 30 September 2014 as of 31 December 2013 Financial assets and liabilities carried at fair value through income Equities 0.5 0.4 Debt securities 0.1 0.1 Other2 (0.1) – Subtotal 0.5 0.6 Investments3 Equities 6.1 5.0 Debt securities 71.6 67.0 Cash and cash pool assets4 5.3 4.9 Other 7.9 7.5 Subtotal 91.0 84.4 Loans and advances to banks and customers 15.1 16.1 Property-Casualty asset base 106.6 101.1 1 Loans and advances to banks and customers, held-to-maturity investments and real estate held for investment are stated at amortized cost. Investments in associates and joint ventures are stated at either amortized cost or equity, depending on – among other factors – our ownership percentage. 2 This comprises assets of € 0.1 bn and € 0.1 bn and liabilities of € (0.2) bnand € (0.1) bn as of 30 September 2014 and 31 December 2013, respectively. 3 These do not include affiliates of € 8.9 bn and € 8.9 bn as of 30 September 2014 and 31 December 2013, respectively. 4 Including cash and cash equivalents, as stated in our business segment balance sheet of € 3.1 bn and € 2.8 bn and receivables from cash pooling amounting to € 4.6 bn and € 3.4 bn, net of liabilities from securities lending and derivatives of € (0.1) bn and € (0.3) bn, as well as liabilities from cash pooling of € (2.3) bn and € (1.0) bn as of 30 September 2014 and 31 December 2013, respectively. ABS within the Property-Casualty business segment amounted to € 4.1 bn, an uptick of € 0.4 bn compared to year-end. This exposure represented 3.8 % (31 December 2013: 3.6 %) of the business segment’s asset base. Property-Casualty liabilities Development of reserves for loss and loss adjustment expenses1 € bn Gross Ceded Net As of 1 January 2014 56.6 (6.1) 50.5 Balance carry forward of discounted loss reserves2 3.2 (0.3) 2.9 Subtotal 59.8 (6.4) 53.4 Loss and loss adjustment expenses paid in current year relating to previous years (11.7) 1.1 (10.6) Loss and loss adjustment expenses incurred in previous years (1.1) 0.2 (0.9) Foreign currency translation adjustments and other changes 1.7 (0.3) 1.4 Changes in reserves for loss and loss adjustment expenses in current year 13.5 (1.4) 12.1 Subtotal 62.2 (6.8) 55.4 Ending balance of discounted loss reserves2 (3.5) 0.3 (3.2) As of 30 September 2014 58.6 (6.5) 52.2 1 For further information about changes in the reserves for loss and loss adjustment expenses for the Property-Casualty business segment, please refer to note 15 to the condensed consolidated interim financial statements. 2 Although discounted loss reserves have been reclassified to ‘Reserves for insurance and investment contracts’ in the balance sheet in 2013, the underlying business development of these Property-Casualty reserves is still considered in the loss and loss adjustment expenses and in the loss ratio and is therefore included in the development of the reserves above. As of 30 September 2014, the business segment’s gross reserves for loss and loss adjustment expenses and discounted loss reserves amounted to € 62.2 bn – an increase of € 2.3 bn compared to year-end. On a net basis, our reserves – including discounted loss reserves – increased from € 53.4 bn to € 55.4 bn. Foreign currency translation effects and other changes amounted to a plus of € 1.4 bn on a net basis.